Crews are on the scene of a Thursday evening crash in White Marsh. 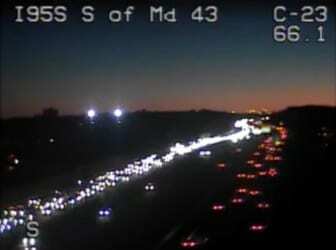 At just before 5:30 p.m., emergency personnel responded to northbound Interstate 95 just before the Route 43 (White Marsh Boulevard) exit for a report of a crash. The Maryland Transportation Authority says that two vehicles were involved in the accident. The two right lanes of northbound I-95 are now closed. The White Marsh Volunteer Fire Company says that two of its engines are on the scene.